What would you do if..? 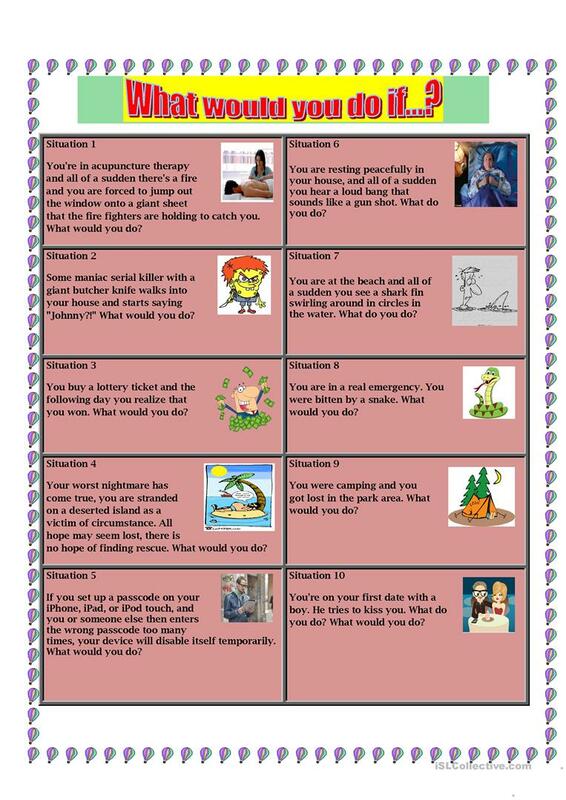 This activity is for practicing conditionals and sharing their opinions about these hypothetical situations. You can cut these cards and give one per student or in groups. Then, they can interact and share their ideas in front of the class. The present downloadable worksheet is recommended for business/professional students, high school students and adults at Beginner (pre-A1), Elementary (A1), Pre-intermediate (A2), Intermediate (B1), Upper-intermediate (B2), Advanced (C1) and Proficient (C2) level. It is useful for improving your groups' Listening, Spelling, Speaking, Reading and Writing skills.